Center Stage: Honoring Musical Legends As Only Disneyland Can! 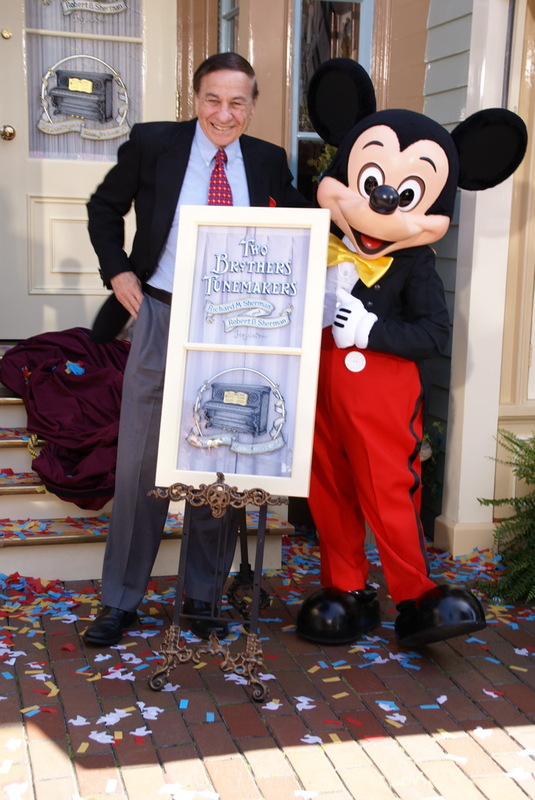 Composer Richard Sherman, Mickey Mouse & "The Window"
The window (–well more like a door actually,) inscribed “Two Brothers Tune-makers” is located right next to the “Mainstreet Cinema“, and was unveiled in a ceremony hosted by characters representing “Mother “ and “Father” (–the narrators from the Carousel Of Progress”), with musical tributes by Mary Poppins and Bert (the Chimney Sweep”) and of course, none other than old Mickey Mouse himself was right there to help with the actual unveiling! While Richard and his wife were there in attendance, older brother Robert, who now lives in England, sent a recorded message of thanks transmitted over an old-time 20’s era radio. 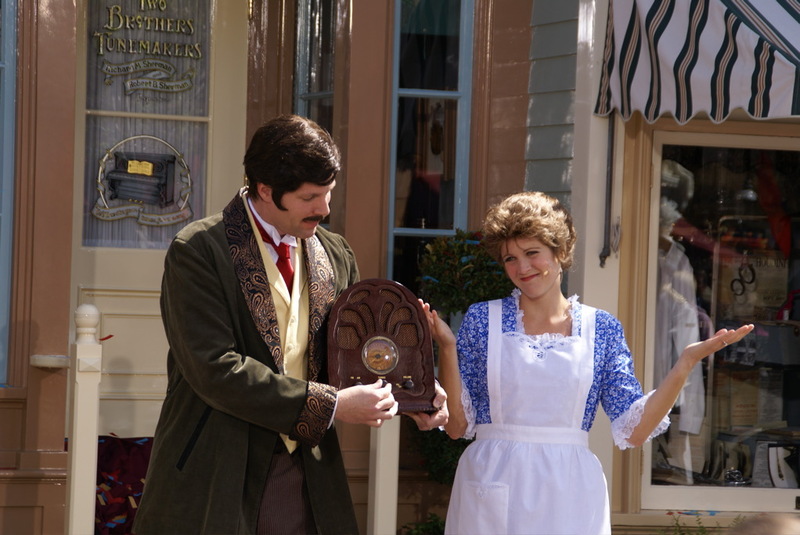 As anyone who knows the Disney organization can tell you, right from the park’s inception, a window on Mainstreet was, and remains, one of the highest and rarest accolades the company can bestow. In fact, I believe one of things that thrills me most about being a witness to all the festivites especially, is that from now on, anytime I’m there, I’ll be able to walk by that beveled glass with the gold leaf lettering, and remember all the well deserved pomp and ceremony, recalling first hand the sense of genuine happiness it brought to everyone involved. In keeping with my goal to explore ’more multi-media’ friendly ways of reporting on this story, I wanted to take advantage of a growing trend among blogs and similar on-line publications, by preparing the following “Audio Slide Show” (–my very first time ever utilizing many of the individual technologies involved!) By no means, perfect, still, my hope is you will find it conveys some sense of what it was like to be there that day–not least of which a bit of the excitement, color and yes, even “magic”, that has become synonymous with Disneyland, The Walt Disney Company, and the incredible music for which two truly gifted gentlemen are universally known. Log on, take a look, feel free to leave a comment–and enjoy! Here’s also sending out extra special thanks to Tim O’Day, Tom Staggs, John Mc Clintock–and everyone at The Walt Disney Company, and particularly once again to my old pal, Lance Perkins for all their awesome assitance in making this report possible. 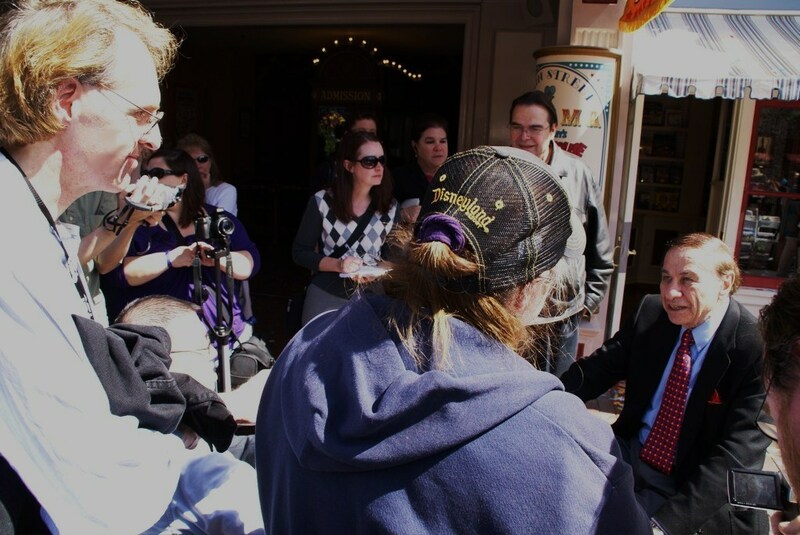 This entry was posted in Ceremonies & Awards and tagged Carousel Of Progress, Disney Music, Disneyland Park, Disneyland Tributes, Mainstreet U.S.A., Richard Sherman, Robert Sherman, Sherman Brothers, Two Brothers Tune Makers Window Unveiling, Wonderful World Of Color California Adventure. Bookmark the permalink.